The writer Giuseppe Prezzolini said that Italian immigrants left behind tears and sweat but not "words," making their lives in America mostly in silence, their memories private and stories untold. In this innovative portrait of the Italian-American experience, these lives are no longer hidden. 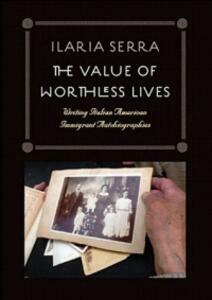 Ilaria Serra offers the first comprehensive study of a largely ignored legacy-the autobiographies written by immigrants. Here she looks closely at fifty-eight representative works written during the high tide of Italian migration. Scouring archives, discovering diaries, and memoirs in private houses and forgotten drawers, Serra recovers the voices of the first generation-bootblacks and poets, film directors and farmers, miners, anarchists, and seamstresses-compelled to tell their stories. Mostly unpublished, often thickly accented, these tales of ordinary men and women are explored in nuanced detail, organized to reflect how they illuminate the realities of work, survival, identity, and change. Moving between history and literature, Serra presents each as the imaginative record of a self in the making and the collective story of the journey to selfhood that is the heart of the immigrant experience.